So last night, the Fourth of July, held a minor victory as our oldest kid did pretty well facing his fear of fireworks. All the kids did pretty well, in fact, with each one showing a little more improvement in the sensory processing realm. Plus, they got to stay up later than usual. Mind you, we didn’t go anywhere for fireworks. We’re just talking about the small-time crackers and roman candles that some folks in the neighborhood set off. Still, progress is progress. Anyway, this morning we ended up paying for the late night and the extra stimulation. As we were trying to get everyone ready for Mass, we were presented with two very strong tantrum-melt downs from two different kids, one stubbornly tired kid who could barely keep his eyes open, and another one exceedingly anxious about the her siblings’ potentially bad behavior in church. We tried to roll with it. We really did. But after a while we realized that Mass just wasn’t going to work. It was too risky. So we played hooky. Sort of. 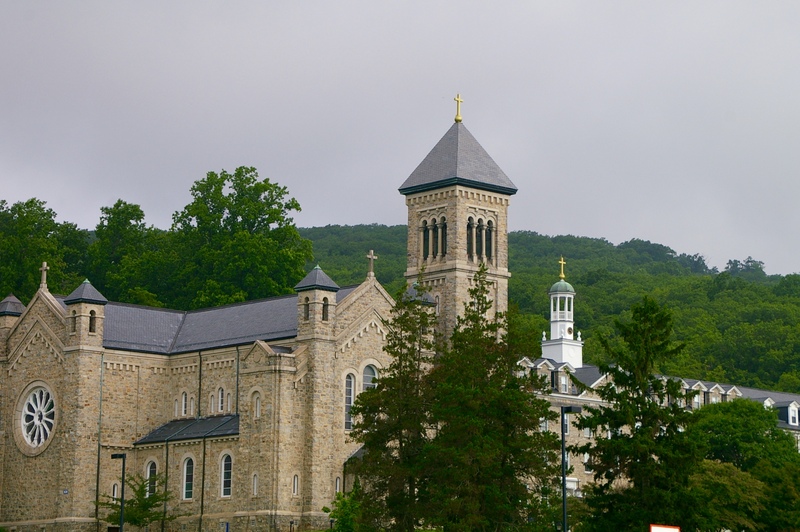 Rather than go to our local church, which is only a half-mile away, we loaded everyone in the van and drove twenty miles to Mount St. Mary’s University–my alma mater of a Catholic college. The van is a safe zone. Each of them can enter their own world, whether by staring out the windows or by putting on their head phones and listening to music or by taking a quick nap. It’s one way to help them press the reset button, and that’s pretty much what happened. By the time we arrived, they were doing better. Not great, but better. We spent about an hour there, walking the nearly empty campus and visiting the Grotto, which is a replica of the shrine to the Virgin Mary at Lourdes, France. We ended with a visit to the grotto chapel, where I had the kids sit as quietly as possible for as long as possible (5 minutes) and told them to try to pray. Then we read the Gospel reading they would have heard if they had gone to Mass, I said a few words about it, and we left. Nothing big. Nothing dramatic. And no other people around. The kids did pretty well overall. We did have to deal with some sensory issues and low-level anxiety. And our toe-walker started to complain about pain in his legs from all the uphill walking. But I was glad that they got the message that Sunday is more than just another day. It’s still the Sabbath. It’s still the day that we honor God as a family. They saw that the alternative to missing Mass isn’t a free pass to video games. I don’t like skipping Mass. I really enjoy the closeness to God that I feel there. And for the most part, I can see how it helps the kids. But as far as I could see, there really wasn’t an alternative. 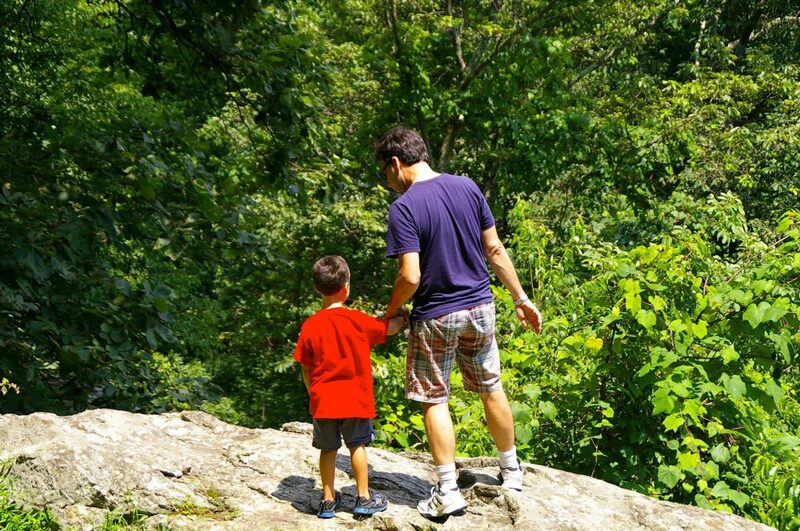 This is one thing that I’ve learned again and again as an autism parent: you have to learn to live by a different set of rules. It seems that everything we do—from church services to school, to recreation to family gatherings—we do differently. And there are times that we have to throw out even our modified rule book. But that’s okay. Because the only rule that really matters is this: Love and accept your kids where they’re at, and they’ll be more likely to follow where you want to lead them.